"3gs" redirects here. For the plural of 3g, see 3G (disambiguation). For the third-generation standard for mobile communication, see 3G. The iPhone 3GS runs Apple's iOS operating system. It was succeeded as Apple's flagship smartphone in 2010 by the iPhone 4; however, the 3GS continued in production until September 2012 when the iPhone 5 was announced. The iPhone 3GS was made available for pre-order on June 7, 2009 and released on June 19 in the United States, Canada, and 7 European countries, and on June 26 in Australia and the United Kingdom. Within the first weekend of its release, over one million iPhone 3GS units were sold. The new features of the iPhone 3GS are mainly internal changes regarding speed. The iPhone 3GS is more speedy and is 2x faster than its predecessor. Though in addition to the upgrades mainly regarding performance, various software features were also introduced exclusive to the iPhone 3GS such as video recording, voice control and digital compass. The iPhone 3GS features iOS, Apple's mobile operating system. The user interface of iOS is based on the concept of direct manipulation, using multi-touch gestures. Interface control elements consist of sliders, switches, and buttons. Interaction with the OS includes gestures such as swipe, tap, pinch, and reverse pinch, all of which have specific definitions within the context of the iOS operating system and its multi-touch interface. Internal accelerometers are used by some applications to respond to shaking the device (one common result is the undo command) or rotating it vertically (one common result is switching from portrait to landscape mode). The LCD display on the device was designed by Apple and made by LG. It features a capacitive touchscreen with a pixel density of 163 pixels per inch (ppi) on a 3.5 in (8.9 cm) 480-by-320 display. Improvements over its predecessor's screen include 24-bit color emulation (18-bit color display plus dithering) for a more color rich display and oleophobic coating to help reduce fingerprints on the display. The capacitive touchscreen is designed for a bare finger, or multiple fingers for multi-touch sensing. The iPhone 3GS features an improved 3-megapixel camera manufactured by OmniVision. In addition to the higher pixel count, it also features auto-focus, auto white balance and auto macro and is capable of capturing VGA video. The iPhone 3GS's camera app features a slider which allows users to switch between capturing photos and recording videos, a tap-to-focus feature which allows users to tap on an area of the camera image to auto-focus on, 5x digital zoom (iOS 4 or later), auto focus and auto exposure lock when holding an area down (iOS 5 or later), and gridlines for composition (iOS 5 or later). The iPhone 3GS is powered by the Samsung APL0298C05 chip, which was designed and manufactured by Samsung. This is the first iPhone with a system-on-a-chip. This system-on-a-chip is composed of an ARM Cortex-A8 CPU core underclocked to 600 MHz (from 833 MHz), integrated with a PowerVR SGX 535 GPU. It has 256 MB of package on package (PoP) DRAM, twice the amount of the 3G, allowing for increased performance and multi-tasking. Apple claims the iPhone 3GS is 2x faster than its predecessor, showing demonstrations of various apps loading in half the time its predecessor does. As on previous models, all data is stored in flash memory and not in the SIM and it does not offer any options to expand storage. Initially it was only available in 16 and 32 GB though an 8 GB model was later released, with Apple discontinuing the 16 and 32 GB models, forcing those needing more storage to select an iPhone 4, or buy an older model 3GS. The iPhone 3GS is powered by an internal 3.7 V 1220 mAh rechargeable lithium-ion polymer battery and is designed to retain up to 80% of its original capacity after 400 full charge and discharge cycles. A battery life indicator in percentage was also exclusive to the iPhone 3GS. Apple claims that the 3GS can last for up to ten hours of video, nine hours of web browsing on Wi-Fi, twelve hours of 2G talk time, or five on 3G, 30 hours of music, or 300 hours of standby. A magnetometer is also built-in the iPhone 3GS, which is used to measure the strength and/or direction of the magnetic field in the vicinity of the device. Sometimes certain devices or radio signals can interfere with the magnetometer requiring users to either move away from the interference or re-calibrate by moving the device in a figure 8 motion. The iPhone 3GS also features a Compass app which was unique at time of release, showing a compass that points in the direction of the magnetic field. In addition to the iPhone 3G's Tri-band UMTS/HSDPA radio and quad-band GSM/GPRS/EDGE radio, the 3GS also adds support for 7.2 Mbit/s HSDPA allowing faster downlink speeds though upload speeds remain the same as Apple had not implemented the HSUPA protocol. Other updates include the addition of a built-in Nike+iPod sensor which eliminates the need for an external sensor and allows native Nike+iPod support. The Bluetooth server on the iPhone 3GS has also been slightly improved adding support for Bluetooth 2.1 specifications. Voice Control was introduced as an exclusive feature of the iPhone 3GS and allows for the controlling of the phone and music features of the phone by voice. There are two ways to activate Voice Control: hold the Home button while in the home screen for a few seconds; or, change the effect of what double-clicking the home button does so it will activate Voice Control (only on iOS 3.x; on iOS 4 or later, double clicking the Home button opens the multitasking bar). VoiceOver, Color Inversion, and Text Zoom were introduced as exclusive features to the iPhone 3GS. VoiceOver is a feature that dictates music details, system menus, text, and other things which was first introduced on the third generation iPod shuffle. Color inversion reverses the color scheme from black on white to white on black, while Text Zoom allows users to zoom into a text on the screen. 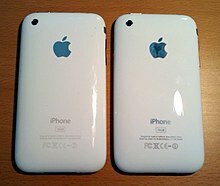 The reverse of the iPhone 3G (left) is almost identical to that of the 3GS, except for the latter's reflective silver text which now matches the silver Apple logo, replacing the 3G's grey text. The iPhone 3GS retains the design of the 3G, with a glossy plastic back with tapered edges and metal buttons. The 3GS has reflective silver text on the reverse side which matches the silver Apple logo, replacing the 3G's grey text. Unlike its predecessor, the iPhone 3GS was available in white and black for 16 GB and 32 GB, although the 8 GB model was only available in black. Reviews of the iPhone 3GS have been generally mixed to favorable. Walt Mossberg of The Wall Street Journal described the device packed with "new features that makes a great product even better, but for many users, the software may be enough of a boost to keep them from buying the new model." Engadget also said that "the additions of video recording, a compass, and a speed bump just don't seem that compelling to us." The device managed to receive numerous favorable reviews. CNET gave the iPhone 3GS 4 out of 5 stars, citing battery life improvements and speed bump. Engadget praised the performance improvements. The 8 GB version received more favorable reviews mainly because it comes pre-installed with iOS 4. Jason Snell of Macworld praised the iPhone 3GS, saying that "the device's internal changes shines in the iOS 4 update, making the iPhone 3GS a worthwhile upgrade compared to its predecessor although a little too late compared to the iPhone 4." TIPB stated that "aside from hardware specific features like FaceTime, Retina Display, and gyroscope support, the bottom line is iPhone 3GS users are getting the same software that makes the iPhone 4 great." Shortly after the release of the iPhone 3GS, some users reported overheating of the device while in heavy use, and others reported discoloration of the device due to heat (particularly on the white models). The discoloration issues were largely discounted as being as a result of iPhone covers rubbing against the back of the iPhone. Apple responded to the heat issue reports by warning users against leaving their iPhones in a car on a hot day, leaving it in direct sunlight for extended periods of time, and refraining from heavy usage while in a hot/sunny environment. It is also worth pointing out the temperature specifications in which the iPhone should be operated, which follows safety standards in the countries the 3GS was released. After the release of the iPhone 4, the iPhone 3GS received an update for iOS 4. After the release of the iPhone 4S, the 3GS was still offered for free on contract until November 2011, when AT&T raised the price to 59 cents with no explanation. The 99¢ price was only available with a two-year contract on AT&T in the United States and a three-year contract on Telus, Rogers, Bell and Fido Solutions in Canada. This was a departure from Apple's previous trends, in which only two phones were sold. On September 9, 2009, Apple launched an updated model of the iPhone 3GS that patched a segment overflow in the SecureROM of the Device that had allowed loading an unsigned LLB. After the release of the iPhone 4S, Apple updated baseband hardware from an Infineon Baseband chip to a Toshiba Baseband chip in week 2 production in 2011 which removed the end-user's ability to change basebands. Although the new chip uses the same modem firmware as the Infineon chip, it cannot be updated to iPad baseband 06.15.00 that is still vulnerable to the AT+XAPP exploit. The 3GS received iOS 6, making it the first iOS device to receive updates for four major iOS releases. Although the 3GS was still supported, some major features of iOS 6 were not supported. The 3GS had generally positive reviews of smooth performance on iOS 5 (some even claim better performance), making it still a good candidate for iOS 6. On September 12, 2012, Apple announced that they would no longer be selling and supporting the iPhone 3GS and the device did not receive iOS 7, due to hardware limitations. On February 21, 2014, Apple issued iOS 6.1.6 to fix the infamous "goto fail;" SSL security bug. ^ Dalrymple, Jim (July 28, 2009). "iPhone manufacturer to pay family of dead worker". CNET. Retrieved October 25, 2017. ^ "iPhone 3GS. More to love. Less to pay. Now at $49, T&C apply". iphone-my.com. ^ Identifying iPhone models. Support.apple.com (April 8, 2013). Retrieved on June 19, 2009. ^ a b c "Apple Announces the New iPhone 3GS—The Fastest, Most Powerful iPhone Yet". June 19, 2009. Retrieved June 19, 2009. ^ Sorrel, Charlie (June 8, 2009). "IPhone Teardown Reveals Underclocked 833MHz CPU". Wired. Retrieved November 20, 2009. ^ "Apple — iPhone — Tech Specs". Apple; Wayback machine. July 14, 2007. Archived from the original on July 14, 2007. Retrieved January 19, 2009. ^ "iPhone 3GS RF Exposure Information". ^ Harry McCracken (June 22, 2009). "What's in a Name? Apple Removes a Space From "iPhone 3G S"". Technologizer. Retrieved September 13, 2013. ^ "'S' in iPhone 3GS stands for Speed". techcrunch. June 8, 2009. Retrieved October 1, 2017. ^ "Compare iPhone 3GS and iPhone 3G". Apple Inc. August 18, 2008. ^ "iPhone 3GS upload limited to 384 kbit/s upstream". Macworld.co.uk. June 9, 2009. Retrieved October 25, 2017. ^ "Apple iPhone 3GS offers speed boost, video capture, new OS". Clone2go.com. Retrieved July 5, 2011. ^ Friedman, Lex (September 15, 2012). "Weekly Wrap: The new iPhone 5, new iTunes, new iPods, and iOS 6". Macworld. Mac Publishing. Retrieved September 11, 2013. ^ a b "iPhone User Guide" (PDF). Apple Inc. May 7, 2012. Retrieved September 11, 2013. ^ "Mobile and Web Application Design & Development". Retrieved August 1, 2015. ^ "Display Showdown Part IIa: iPhone 3GS". DisplayBlog. February 23, 2010. Retrieved July 5, 2011. ^ Foresman, Chris (December 23, 2009). "Apple may bump camera in next-gen iPhone to 5 megapixels". Ars Technica. Condé Nast Digital. Retrieved September 25, 2013. ^ Patel, Nilay (June 10, 2009). "iPhone 3G S processor specs: 600MHz CPU, 256MB of RAM". Engadget. AOL. Retrieved September 25, 2013. ^ Michaels, Philip; Snell, Jason. "iPhone 3G S offers speed boost, video capture". Macworld. IDG. Retrieved October 6, 2013. ^ Mossberg, Walter S. (June 19, 2009). "Apple iPhone 3G S Is Better Model – Or Just Get OS 3.0". The Wall Street Journal. ^ a b "iPhone 3GS review". Engadget. Retrieved July 5, 2011. ^ "Apple iPhone 3GS Review – Watch CNET's Video Review". Reviews.cnet.com. Retrieved July 5, 2011. ^ "Apple iPhone 3GS". entechgadget.com. Retrieved July 12, 2012. ^ "Apple 8GB iPhone 3GS Smartphone Product Information". Macworld. June 25, 2010. Retrieved July 5, 2011. ^ "$99 iPhone 3GS review". TiPb. July 4, 2010. Retrieved July 5, 2011. ^ David (CNET) Martin (July 9, 2009). "Apple says cases cause iPhone 3GS discoloration | iPhone Atlas – CNET Reviews". Reviews.cnet.com. Retrieved July 5, 2011. ^ "Apple Admits iPhone 3GS Overheats – News". Trusted Reviews. Retrieved July 5, 2011. ^ "iPhone, iPad, and iPod touch (4th generation): Keeping device within acceptable operating temperatures". Support.apple.com. March 24, 2011. Retrieved July 5, 2011. ^ "Apple drops iPhone prices: 32GB 3GS free, iPhone 4 now $99". Engadget. ^ "0x24000 Segment Overflow". theiphonewiki.com. ^ "iOS 6 features". Apple. Archived from the original on June 13, 2012. Retrieved July 26, 2012. ^ "iOS 5 performance 3GS". Anandtech. ^ La, Lynn (June 10, 2013). "Apple devices that aren't invited to the iOS 7 party". CNET. Retrieved August 1, 2015. ^ "goto fail; test site". Supporters of EFF. Wikimedia Commons has media related to IPhone 3GS.